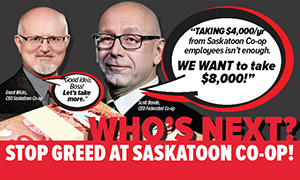 YOUR URGENT HELP NEEDED: Stop Greed at Saskatoon Co-op! Saskatoon, Sask. – December 2, 2018 – Calling all UFCW members, activists, and allies: UFCW 1400 members in Saskatoon need your help! Hard-working members at Saskatoon Co-op are on strike making a stand for fairness and the future of good jobs. They need your help. Please take 30 seconds to send a letter to Co-op CEOs Scott Banda and Grant Wicks telling them to stop betraying Co-op's values and to do the right thing! Send a letter and find out more at ufcw.ca/saskatooncoop.